Pharrell Williams is upping his style status once again. The "Happy" singer is gracing the special-edition cover of Elle UK's July issue. Pharrell ditched his omnipresent Vivienne Westwood mountie hat in favor of a native American feather headdress for the Doug Inglish photographed shoot. And while the image is definitely powerful, not everyone is pleased with the cover. In fact, the Native American community and beyond are expressing their anger over the honored accessory's misappropriation via social media. Search the hashtag #NotHappy and you'll see just how pissed folks are. And some are calling for the 41-year-old musician and fashion glossy to issue an apology. You'd think Elle UK would have gotten the never-use-a-headdress-unless-you're-native-American memo after Chanel, Victoria's Secret and H&M were confronted with backlash for attempting to turn the American Indian headdress into a fashion statement. 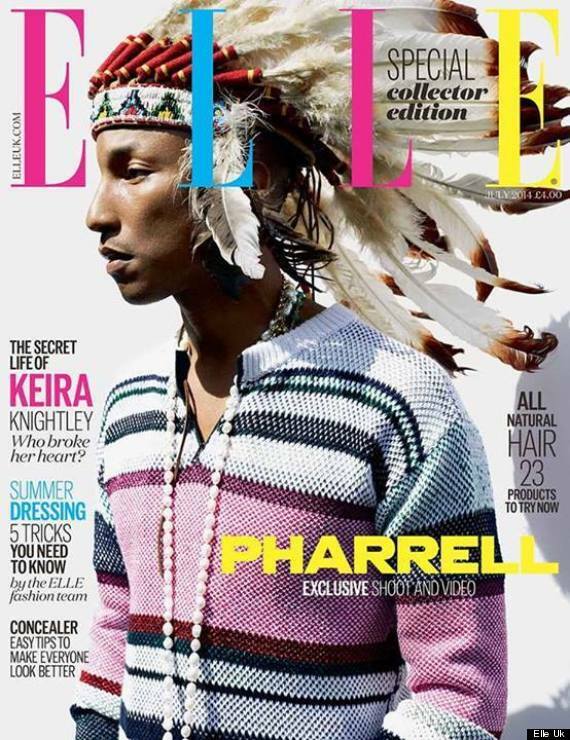 UPDATE: Pharrell responded to the headdress controversy with an apology sent to Buzzfeed. "I respect and honor every kind of race, background and culture. I am genuinely sorry," the artist and producer stated. St. Patrick's Day-themed SB Dunk Low <a href="https://www.huffpost.com/entry/nike-black-and-tan_n_1344197" target="_hplink">"Black and Tan"</a> sneakers by Nike incite outrage from Irish community.